It seems I am always on the go. The alarm goes off and I hit the floor running with an agenda a mile long. Will I ever get it all done? My growing list of emails to respond to, stories to write and edit, music to rehearse, phone calls to make, bills to pay………and the list goes on and on. Seems like a giant mountain to climb. There is so much more to do and so much work I genuinely enjoy, but my brain is telling me to stop. It is full. It needs some downtime. I suddenly realized that my running list and agenda rarely includes time to just stop. It is a list that keeps me on the green light and never on the red light. It was in that very moment of realization that I recognized the importance of stopping before going. In a normal day, there is so much coming at me all at once, so much to process that it seems I just cannot deal with it all. According to scientificamerican.com, many research studies strongly support the importance of downtime. The importance of taking time to just stop has been shown to replenish the brain’s stores of attention and motivation, encourage productivity and creativity, and allow us to achieve the highest level of performance. Why do we fill up our lives so much? Every minute of every day is full with something that must be done. What is that about? It is easy to find yourself always pouring but rarely stopping to drink. Many Abrahamic (Jewish, Christian, and Muslim) religious teachings emphasize the importance of treating our bodies as sacred through what we eat, drink, and do. Buddhism and other world religions support reflective time, prayer, and moments of silence as ways of renewing our minds and souls. In order to truly love and care for another, we must love and care for ourselves. We must stop before we go. Stop to reflect. Stop and take time for self. Our minds and bodies are always in motion. This has tremendous negative implications for us mentally and physiologically. 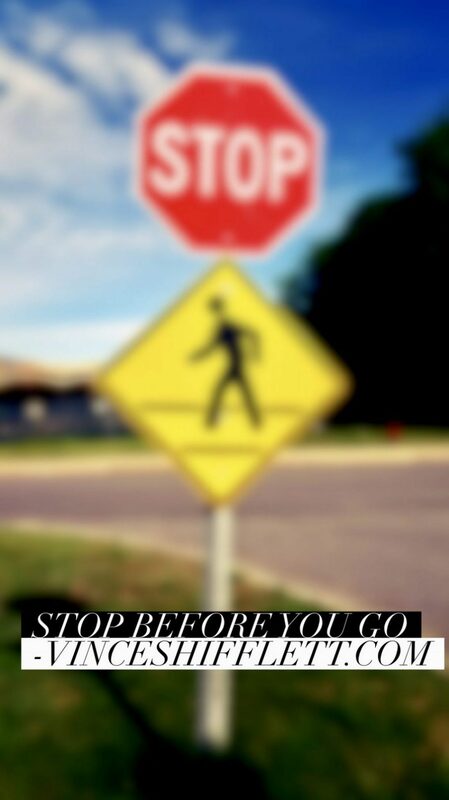 Stop before making decisions. Stop to think before speaking. Stop to think before reacting. Stop before casting judgment on another. Stop and know the facts before making assumptions. Just stop and think as opposed to allowing our minds and bodies to be on autopilot. I work in a very fast paced environment as a Registered Nurse. I am finding that my mental resources are constantly depleted throughout the day. I have made a commitment to myself to stop between each patient, close my eyes, and take a few deep breaths. I have found renewed energy and patience in this process. Take a few minutes out of your day, even if it is only 5 minutes, to just stop and be silent. Stop and take a few deep breaths. It will make a difference. Step outside, breathe the fresh air, and feel the sunshine. It will calm the mind and body. Stop before you go. It can save you a lot of unrest moving forward on your journey. One cannot take back actions or words that have been spoken. Taking a minute to just stop can bring more peace to your life. Until next week, remember to just always stop before you go. Pause. Reflect. Think. Very true and very good advice! We all need to enjoy life more along the way! Thank you for the wonderful blog of reminding us to make and take time out of busy day, lives to breathe, rejuvenate, reenergize our mind, body’s and spirit. I’m constantly reminding myself that I can not pour from an empty cup. What’s in the cup is for me and the overflow is for everyone else. So, I must be intentional about monitoring how full is my cup, when it’s getting low and the capacity I have to keep it overflowing in order to be fully present to give to and be there for others. Thank you Brodderick for your comments. Being fully present can be challenging with all the external stimuli but it is vital. I appreciate you. The world would be a different place!, Thanks Vince. Thanks as always for your input. We cannot change the world. We can only change ourself and hope it has a ripple affect.